Dr. Bill Creasy presents the gospel according to John with insight and warmth. This gospel gives a personal account of the life of Jesus, from his works of public ministry, to his death, burial, and resurrection. Dr. Creasy, a professor of English literature, gives a nuanced and smart interpretation of the text. With his great stage presence, Dr. Creasy's lecture makes for easy listening. Because it is live, though, a few moments apply only to the audience present. Still, Dr. Creasy is so engaging that curious listeners will benefit from this series as much as devoted Christians. Written considerably later that the Synoptic Gospels (Matthew, Mark, and Luke), John takes a very different approach to the Gospel story. Traditionally attributed to the "Beloved Apostle" John, this Gospel doesn’t give us yet another version of the events in Jesus’ public ministry; John illustrates what those events mean in light of 60 years of reflection upon them. The Gospel according to John is a brilliant book, and it offers us a profoundly intimate glimpse into the person and work of Jesus Christ. Listen closely as Logos Bible Study’s Dr. Bill Creasy reveals the nuances of this amazing work. This book is a must have for your audio library. I also posted this on Amazon.com. This series contains the audio from class lectures by Dr. Bill Creasy. 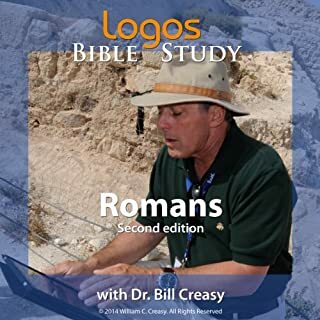 Dr. Creasy covers each book verse-by-verse, providing context to the material by explaining other passages in the Bible that may relate to a passage under study, with descriptions of corresponding historical events and the geography and their relationship to the passage, as well as anecdotes from his travels or study. I find it extremely helpful to study the Bible in context with geography and history. As explained in the opening lesson on Genesis, this study starts with Genesis in the Old Testament, then moves to Matthew in the New Testament, then Exodus and Leviticus in the Old Testament, then back to Mark in the New Testament, and so on. Dr. Creasy does this because 1) if covered in weekly segments, as done in his class, it would be in year 5 before he got to Matthew, and 2) to help show the relationship between Old Testament and New Testament. According to the syllabus I received from Dr. Creasy (he sometimes deviates from this in class), John is the ninth in the Logos Bible Study series, preceded by Deuteronomy and followed by Joshua. John has 21 chapters, and the study is comprised of 17 lessons. Total time - 11 hours, 43 minutes. Note: Dr. Creasy does give a little introduction to Joshua in the last lesson. Through John, you learn so much more about the human side of Jesus. I never saw Him in this intimate a way... Jesus has always seemed too high to reach or understand in all His glory. Too much out of my league to even truly pray too as I figured my words would be just gibberish to His highly developed mind. Through John, you can become friends with Jesus as well as glorify His name. And as always, Bill Creasy teaches The Book in a way all minds can enjoy and understand it. I learned a lot & found the information very engaging. 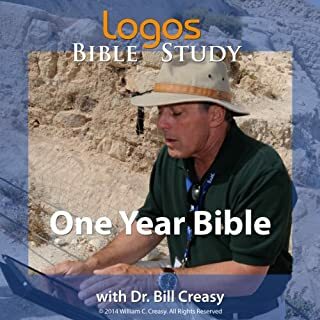 I am going to listen to additional books by Dr. Creasy. I did not know I would enjoy bible study so much. Dr. Creasy’s approach has helped me to grasp, enjoy & value the Bible so much more than I ever have before. I just wanted to listen to the whole audible from start to finish in one sitting. I like how Dr Creasy brings the characters to life and how he defines certain words from its original Greek word. I've listened to several Dr Creasy's Bible books. John was the best. Details that put me there beside the Jordan river, inside the upper room at Martha's and and in the synagogue with Jesus teaching - these windows into that time helped me collate the facts into a cohesive record. Dr Creasy's best lesson is the Gospel of John. FANTASTIC, LOVE DR. CREASY'S TEACHING... VERY THOROUGH KNOWLEDGE AND UNDERSTANDING. WOULD RECOMMEND EVERY CHRISTIAN TO GO THROUGH THIS STUDY. Nothing short of amazing as always, the words literally come alive. for the first time, I get it! 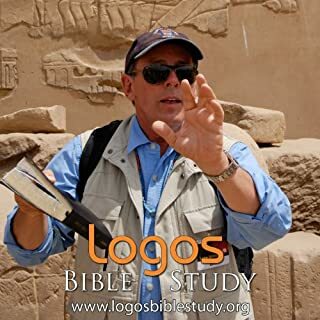 Outstanding study of the Bible! now have a greater understanding of the Bible. This study is for all denominations. Dr. Creasy is a teacher and what you choose to do with the knowledge he has given you, is entirely up to you. Dr Creasy is inspirational. Thank you. I have really enjoyed this. Yet another job, well done.